Susan Moray first learned about ADUs from a realtor friend who had taken Kol Peterson’s ADU Class for Homeowners. 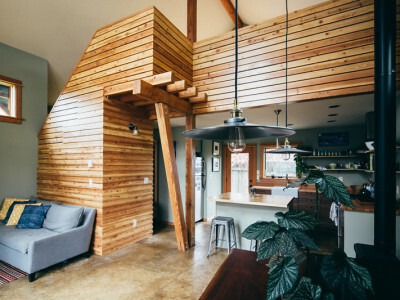 The next time Kol’s class was offered, Susan attended and she soon decided to convert the garage of her Ladd’s Addition home into an accessory dwelling unit. There were several factors influencing Susan Moray’s decision: flexibility as her housing needs changed, income potential, and the option of having family close by. 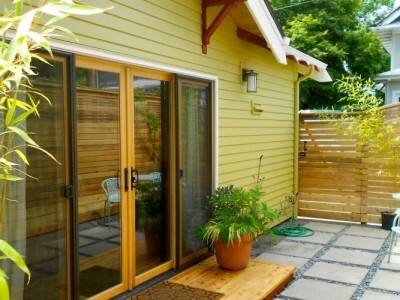 Additionally, Susan was motivated to build sooner rather than later because she knew that Portland’s waiver of System Development Charges (SDCs) for ADUs was set to expire. James Michelinie and Kyra Routon first learned about ADUs when they were house hunting as newlyweds. 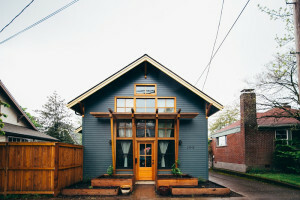 They’d been renting a house in the Alberta Arts District for the past two years and they were looking for a property they could afford in a neighborhood they loved. They knew they didn’t need much space to start since it’s just the two of them and their two dogs. However, they wanted flexibility and room for their family to grow. Eventually, they decided to stay right where they were.